What a weekend it has been. If you're new here and didn't know, I have a toy Yorkshire Terrier named Chloe and she turns 7 in a few weeks! She is my world, literally.. She is my actual human dog. She got really sick over the weekend and at 3am Friday night we ran her up to the animal hospital. I was finally able to pick her up early this morning and she looks and is acting so much better. I was a wreck the whole time she was gone. I am so thankful she is all better! Now on to what this blog post is about. Forma and Laser. Before the wedding, Samantha from Rejuvenation Med Spa in Pasadena reached out to me to partner up to prepare for my wedding! 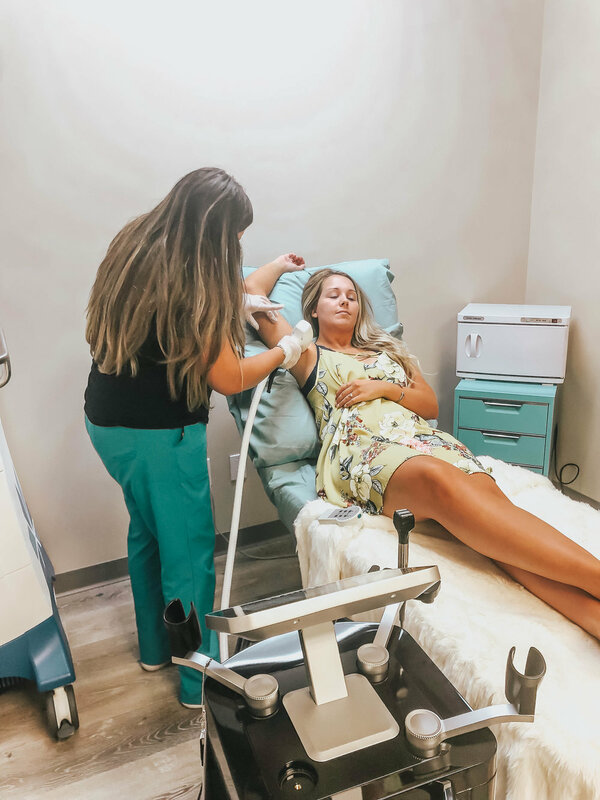 We completed 4 Forma skin treatments and 2 Laser Hair Removal treatments! Below is a photo of my before and after Forma Treatments. As you can see, my jaw line is tighter and more firm and my skin has a glow to it! My skin is still feeling great. Forma is a skin tightening treatment. 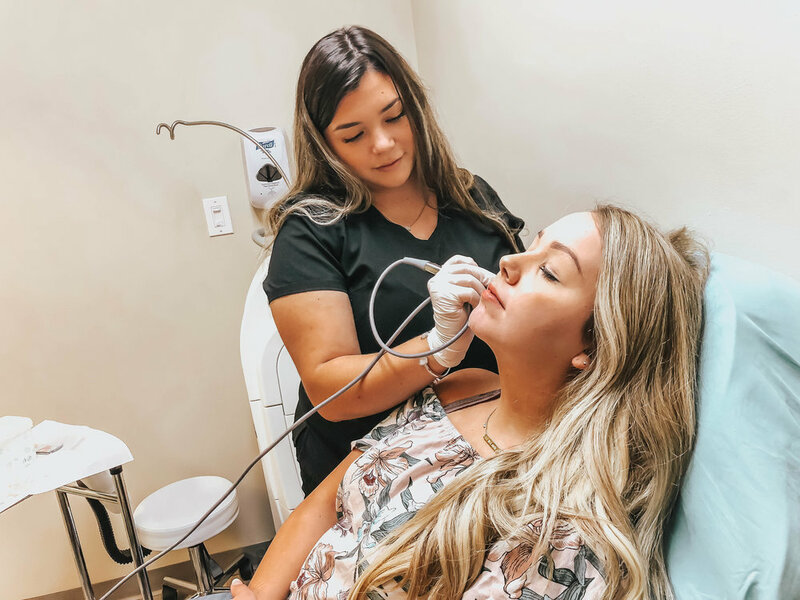 It is a radio-frequency treatment that activates the collagen in your skin to help tighten and improve the overall look and feel of your skin! Sounds amazing, right? Best part is, IT DOESN'T HURT and there is no down time! It feels like a nice warm stone massage. 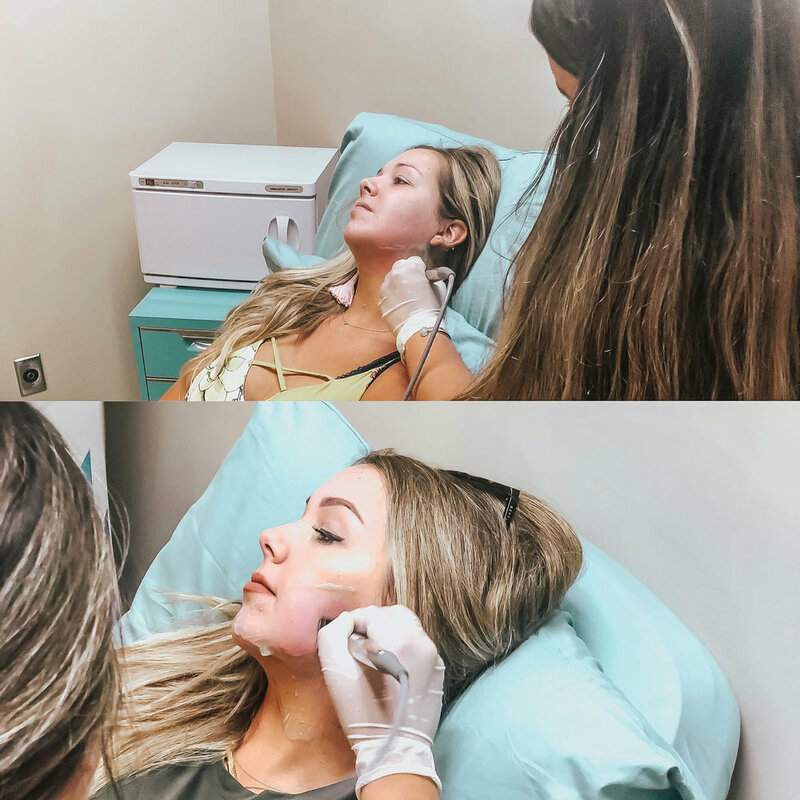 I had this treatment done 4 different times on my chin/upper neck area and I saw immediate results in the look over my skin. After 4 sessions, I noticed that I had more definition in my jaw area and my skin is extremely soft and tight! The recommended amount of treatments for permanent results is 6 sessions total (once a week for 6 weeks is best)! I've included a little video below kind of showing the process and how painless it is! We did the Forma on my cheek and jawline areas. Each side took about 10-20 minutes per side! Laser Hair Removal.. sounds scary right? I did not plan on having this done! I went in for my Forma treatment and we both decided I should try it on my underarms! I had never looked into Laser Hair Removal beforehand. I didn't know if it was painful, or what it would be like in general. Let me tell you, it's an uncomfortable pain but it's extremely fast because it's such a small area. But let me tell you.. I have done it twice (you should do it 6 times for permanent results) and I haven't shaved my under arms since August 17th.. WHAT! Best thing ever. So, to me the pain was TOTALLY worth it. I definitely want to get it done on my legs, but super nervous! Have you ever done it before?! Let me know!! For 15% off your Forma treatment, reach out to Samantha and mention That's So Gold! So my answer? Yes! They're both worth it!